After the last post, here’s a more seasonal lunch I made with ingredients I already had. We had some Napa cabbage and bell pepper that needed to get used up, and this is the salad that they turned into. 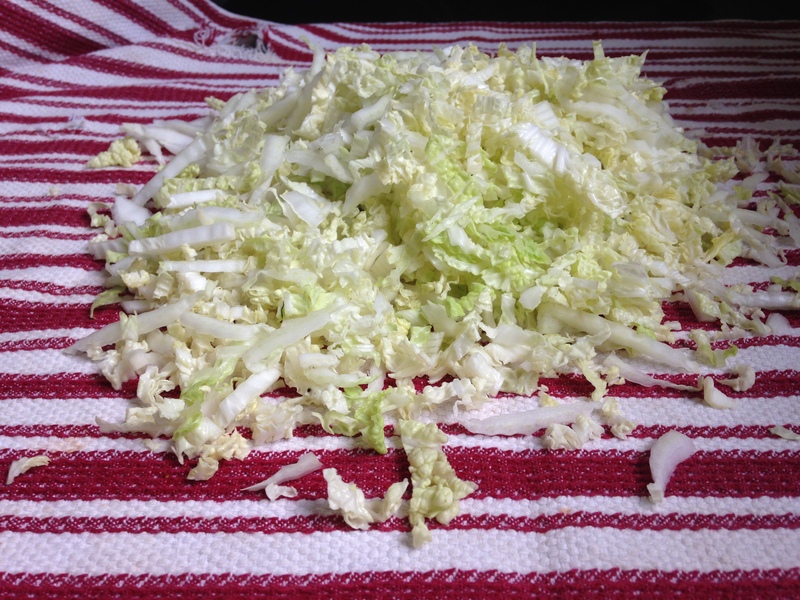 Napa cabbage is my favorite cabbage—it’s crunchy and mild, and it lacks the toughness and pungency that some other cabbages have. I wanted to use the Napa cabbage raw and make some sort of salad with it, but most of the recipes I found with it were meant to be used as side dishes, and I wanted something that would be more filling so I could take it as a one-dish meal for lunch. 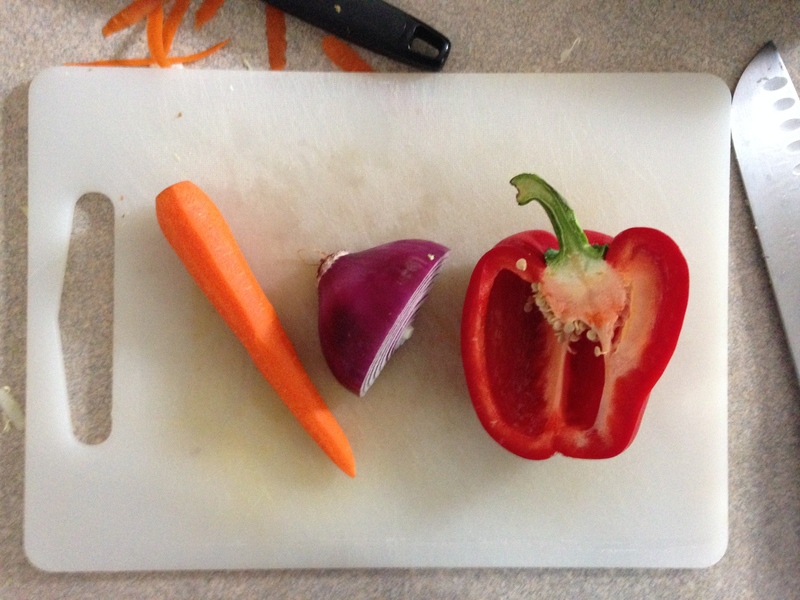 I went with carrot, bell pepper, and red onion for the other vegetables, partly because that’s just what I had, and —you guessed it—I didn’t feel like going to the grocery store. I imagine that cucumber, sugar snap peas, and/or snow peas would also be good in it. For the dressing, honestly, I was hoping to re-create something similar to the sesame coleslaw at Café Asia, which is dynamite. Usually, trying to imitate something I had in a restaurant is a recipe for disaster. (Pun intended.) My version inevitably ends up significantly inferior to whatever I was trying to mimic, and it just leaves me with an even worse craving for the restaurant dish. This dressing, though—this dressing turned out pretty darn well. Just be sure to read the note about the consistency. Note: If you’re going to use the dressing right away, you might want to thin it down with extra vinegar or some water. If you’re going to keep it on hand for a while, just let it rest. Mine got much, much thinner after a night in the fridge, and I don’t have an Alton Brown-y scientific explanation for why. Also, for the chicken, I used the spicy asian marinade from Epicurious. Whisk together all of the ingredients until smooth. Taste for seasoning. I didn’t add any salt because the miso paste was salty enough. Divide the vegetables evenly onto two plates. Top with the chicken, and the sesame seeds if using. Add dressing to taste and toss. You might not use all of the dressing.